Iron Fist Swimwear & Accessories! I came across an Iron Fist booth 2 years ago at Viva Las Vegas and have been hooked ever since. I purchased a pair of Zombie pumps at that booth and I remember thinking “these are AWESOME”. The zombie design, bow, and decaying heel stole my heart. I wore them to car shows, parties, the whole nine and people would stop me asking where I got them from. This is no ordinary brand. What sets Iron Fist apart from other street wear counterparts is its ability to be so artistically diverse. The artwork and styling is exceptional and constantly evolving. Iron Fist caters to men, women, and children who are edgy and stylish. They offer you quality apparel and accessories at such great and affordable prices too. Many of you have been asking me about affordable swimsuits so just in the nick of time, I present to you Iron Fist swimwear! Check out some great Iron Fist swimwear and accessories modeled and styled by me, and shot by Miguel Oliver of OliverPhotosNYC. What I love about Iron Fist bikini’s is that you can wear them with or without straps. Don’t want annoying tan lines? Just tuck the halter straps in and you are good to go. I love this pattern too, makes me feel like Jane of the concrete jungle ;). These shoes are one of my FAVORITES from Iron Fists fabulous assortment of shoes. The Victorian skull pattern, black and white stripes, and skull charm fits my personality just right. I love that these are naughty and nice at the same time. I picture myself wearing a babydoll dress with these to add some edge to my look. These shoes are delicious and the texture is a soft suede. Tasty! I just want everything in this zombie pattern, can you tell? I mean, who wouldn’t want to prance around in a zombie bikini on the beach? Let-em know I am not afraid of a little sand ;). I have a weird infatuation with monsters, what can I say? Especially crazy blood lusting pink monsters! These shoes are OUT OF THIS WORLD! 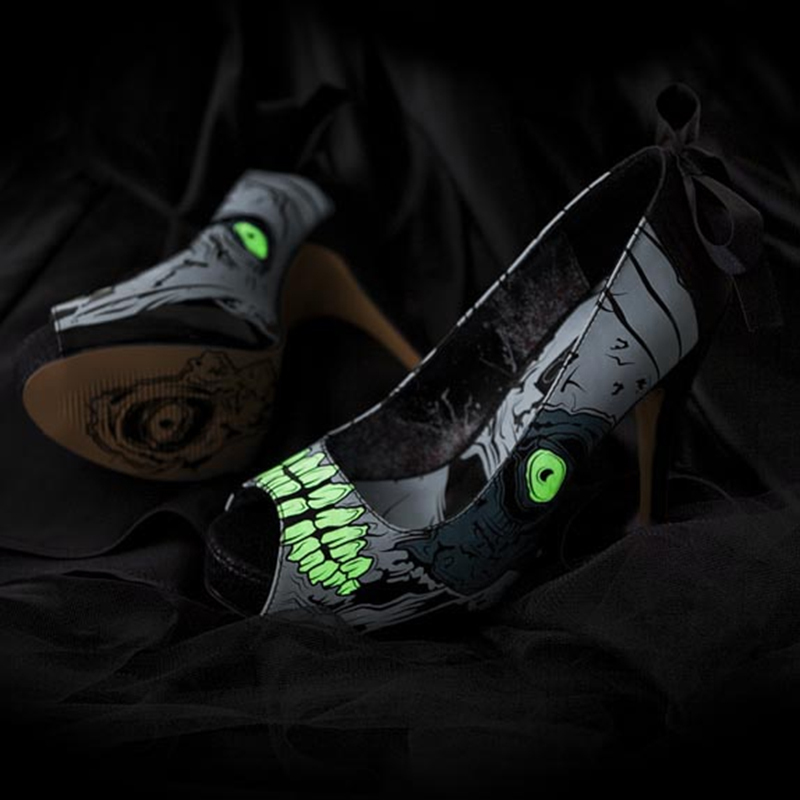 I mean, who doesn’t want glow in the dark zombie pumps?! I wore these a few times at night and people were blown away! All you pinups out there can relate to this one. The blue and red colors, rusty anchors, and octopus legs are perfect for all of those mermaids who talk like a sailor ;). Make it work by throwing in some red pumps and a hair flower and you are set! Photographer: Miguel Oliver of OliverPhotosNYC. Check out the Iron Fist shop now! Follow Iron Fist on Twitter! Special thanks to my cousin Miguel Oliver for taking such great photos! Book him by clicking his info^! Great pics with great products. Very nice shoot, both you and Miguel did a great job. Oh I must know, where did you buy that black dress? It’s gorgeous!! Absolutely breathtaking darling! Love to see a woman with real curves!! You are so inspiring! Omg!..I love the shoes the bags n the bathing suits..U one girl who could pull any type of style n bring out the beauty of the item as well as u..Love it!..Keep up the wonderful work u do mama!..U have an enormous beautiful talent in u..I wish someone would see how much talent n experience u have in fashion..Wish u the best baby girl..